Sitting in traffic can be frustrating, especially after getting out of work or going somewhere fun over the weekend. One of the worst parts of traffic is not knowing what caused it. We&apos;ve noticed an increase in traffic around Chicago’s North Side streets. To figure out what was causing the traffic we went for a drive up and down Broadway. Turns out that a combination of CTA Red Line reconstructions, street resurfacing and sewer work are creating some bad traffic conditions. 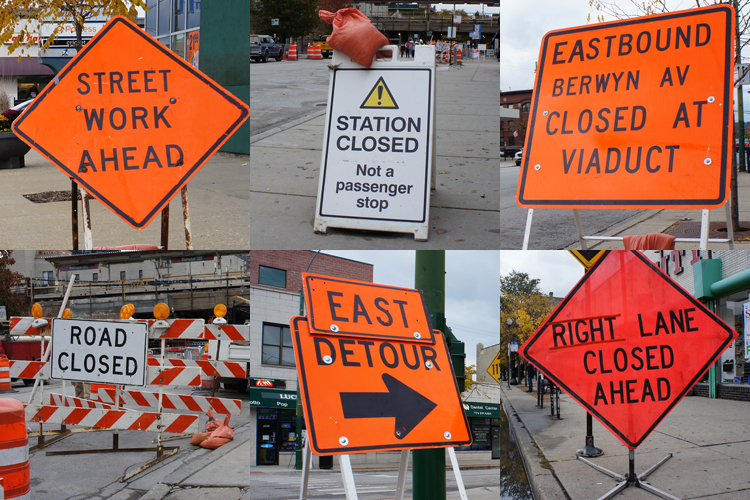 We also spoke with former WBEZ traffic analyst, Sarah Jindra, who pointed out some of the busiest construction points. CTA is in the process of making improvements at seven stations along the north branch of its Red Line. Work includes viaduct repairs, platform repairs or replacement, station water proofing, lighting improvements and new station house finishes (i.e. floors, doors, windows and lighting). They have already completed work at 4 stations: Granville, Morse, Thorndale and Argyle. Currently, the Berwyn station is temporarily closed for the work. And at midnight Friday, the Lawrence station shut down for six weeks. The last station to get worked on is the Jarvis station, which is scheduled to start on Nov. 9th. Commuters can expect street blockages in areas of work and several CTA bus reroutes. The entire project began on June 1 and is scheduled to be completed by the end of the year. Each station closure is not expected to last longer than six weeks. Separate from the project above, CTA is working with Loyola University to make improvements to this station but it remains open throughout work. Commuters can expect Sheridan Road to be down to one lane heading northbound through the area until the end of October. Work on the station began in August and is scheduled to be completely done by mid-2013. Some lanes will be reduced on Fullerton Avenue between Cannon Drive and Lake Shore Drive for bridge reconstruction through December. This is the bridge that crosses the Lincoln Park Lagoon. It is also near the entrance for Lincoln Park Zoo parking lot. The lot remains open during construction, but you can expect added delays. Construction continues through the end of the year. The ramp from northbound Michigan Avenue to northbound Lake Shore Drive is blocked for repair work to the viaduct. Northbound traffic is being rerouted to Inner LSD for about a mile to LaSalle Drive where drivers can re-enter LSD. This project is expected to be completed Nov. 16. There is also resurfacing work of LSD from Sheridan Road to Foster Avenue and from Belmont to North avenues. The majority of this work has been completed. All work is expected to be done by Oct. 24. Devon Avenue is blocked from Ridge to Western avenues for sewer work through Nov. 30. Lane blockages on Peterson Avenue between Lincoln and Western avenues for sewer work through the end of the year.